The accoya wood is fully biodegradable and renewable. The Mosa façade system on the wall can be mounted, demounted, disassembled and completely recycled. The window systems are made mostly from glass and aluminium, both completely recyclable. 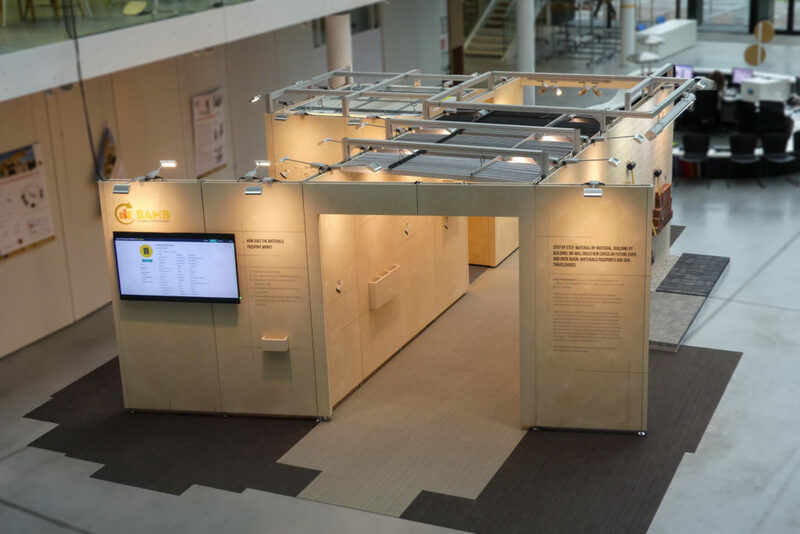 REMS showcases many circular and renewable alternatives to conventional products, such as Ecor panels (in the foreground) made from recycled cellulose fiber and Doscha wool insulation (visible in the wall). 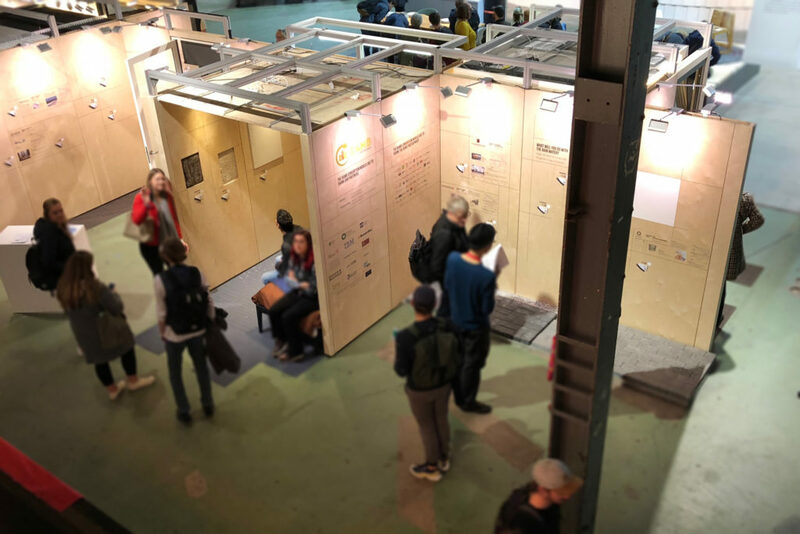 The Modules made it to the ‘Dutch Design Week’ (20-28 Oct 2018) with some 2600 designers and more than 335,000 visitors. Their appearance was drastically changed to meet the design requirements. A striking example of the modular design features of the REMs. 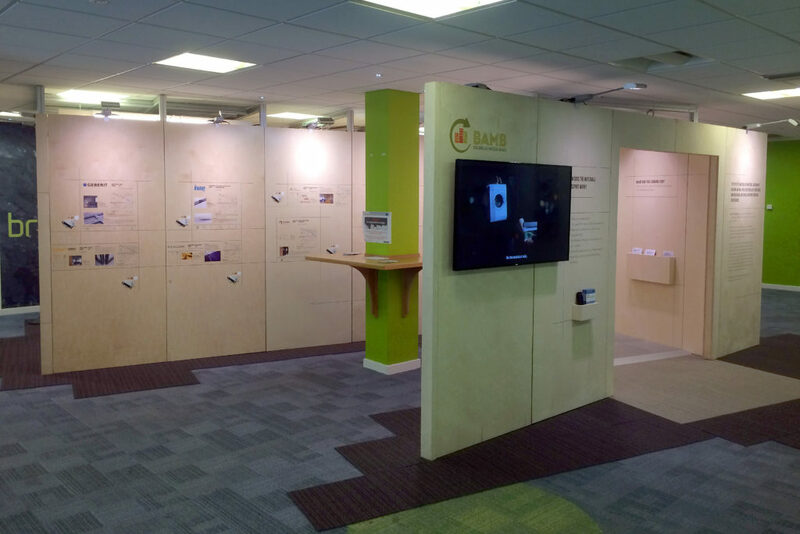 All the more impressive for a display of products that embody reversible design. Watford, the third location of the REMs, challenged the design, but it seamlessly adapted to its new surroundings. We literally had to squeeze into our space at Watford, UK. A testament to the importance of good measuring. A very neat fit for our Reversible Experience Modules (REMs). 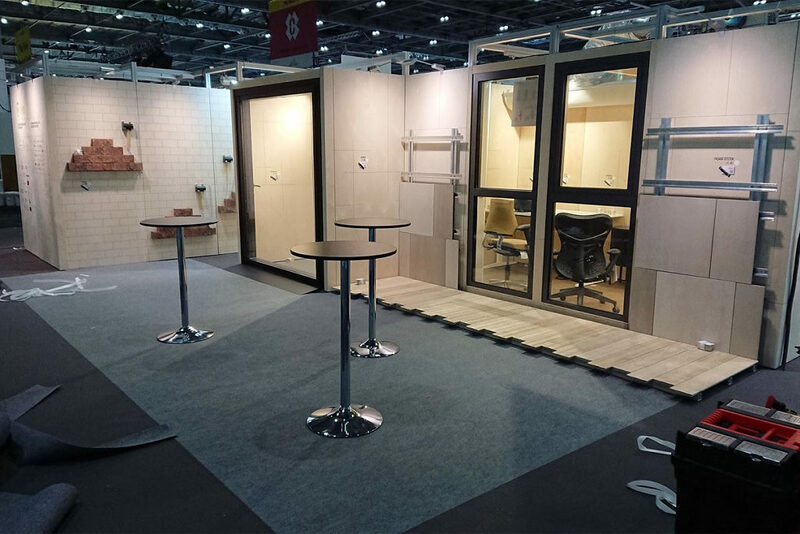 Video of visitors exploring the many modules at ‘Ecobuild’ in London for a hands-on feel of reversible building. 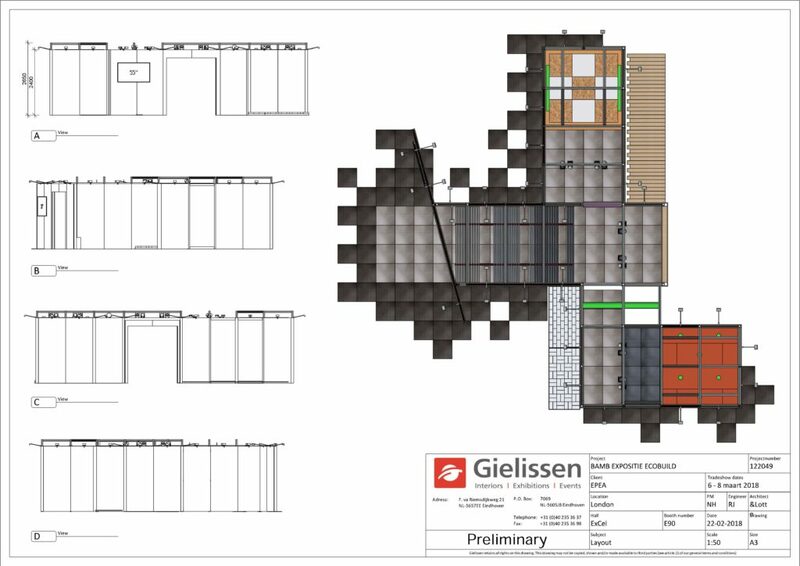 This is the design for the REMs at Ecobuild in London. 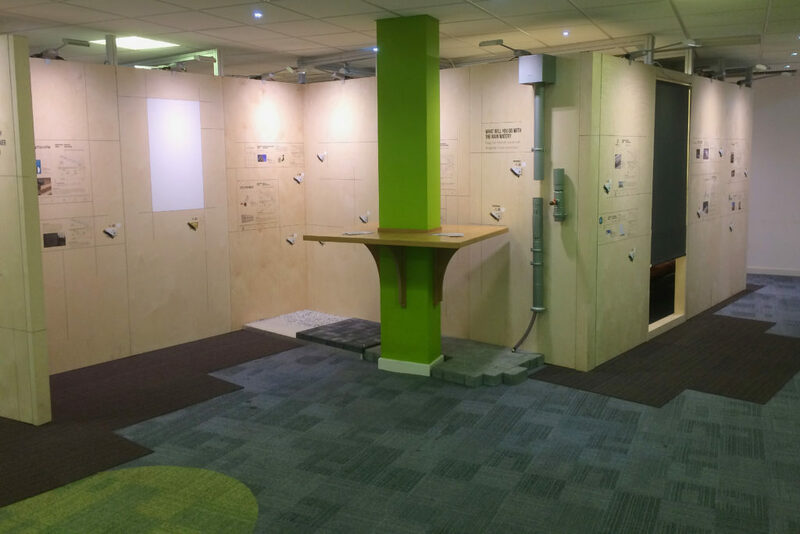 The tile layout had to be adapted to fit the requirements of the Ecobuild trade fair, and it was our first full setup. 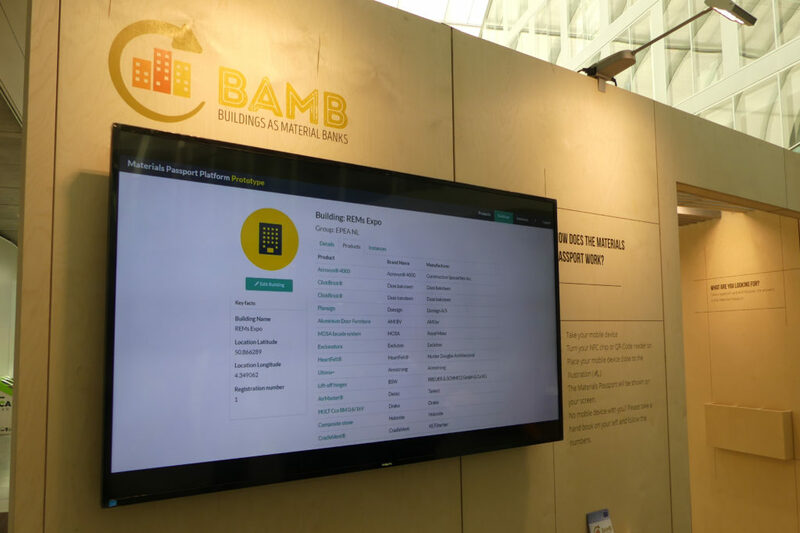 For the very first time, the Reversible Experience Modules (REMs) were displayed at Brussels Environment. The hall and a small part of the office space were built at this location. 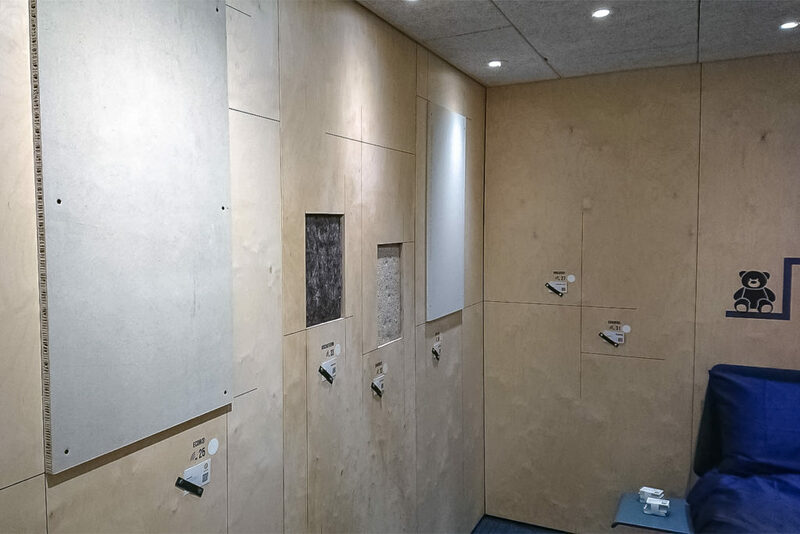 On its walls, visitors could view many of its 70 reversible construction products. Using their phones, Brussels visitors could now find information for each displayed product by scanning the product QR codes. This was the first time the public got try out the online Materials Passport platform. All the products in the REMs were available.